Membership billing allows for one-button fixed charge posting across the board to all customers designated for those charges. Membership Billing is used for clubs with memberships and the settings in A/R are unique from typical hospitality direct billing. If you need to process hospitality direct billing and club membership billing, we suggest that you set up the hospitality direct bill in the Hotel company and club membership in a different company so that they can be configured separately. See Your Company Setup. You may post up to four automatic fixed charges per customer but you may set up as many as you wish. You may wish DUE1 to post membership dues to one customer and DUE2 to another customer. Although only four codes may apply per customer for automatic fixed charges, you may manually post additional charges. Each transaction code must have a fixed dollar amount in order to post automatically. See example below. For complete Transaction Code Setup instructions see Control Files Setup. 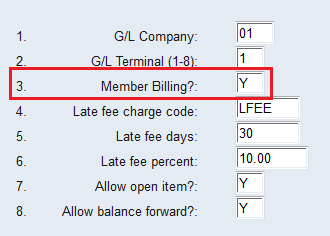 Answer Y in Field 3, "Member Billing?". Answer Y in Field 8, "Allow balance forward?" See example below. For complete Direct Bill Parameter Record Setup instructions see Control Files Setup. The Customer Setup screen is different for Membership Billing than for normal hotel Direct Bill. See below. "Account type (O/B):" should be B for membership billing. "Corp account code:" and "Statement to" are not used. Leave them blank unless advised otherwise by Execu/Tech. 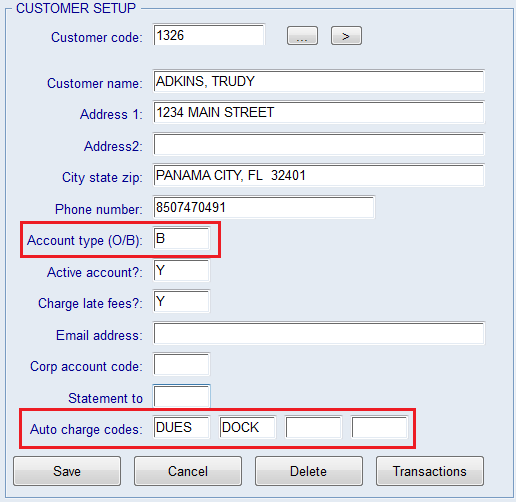 "Auto charge codes: " allows up to four transaction codes per customer for automatic fixed charge posting. 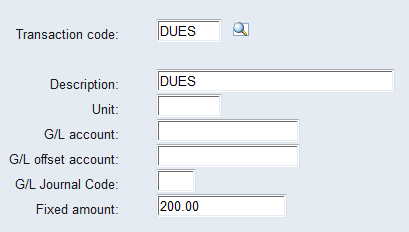 In the example above, DUES (Membership dues) and DOCK (dockage) are selected to post automatically. Contact Execu/Tech to add the membership programs and to edit the Direct Bill menu. There is no charge for this for customers on support. However, training is billable. Customers not on support will be provided a BSA (Billable Services Authorization) for the installation of this program and to have it added to the Direct Bill (City Ledger) menu. Email your request. See Member Billing for instructions on posting and billing procedures.